Built in the 1790’s by a wealthy local landowner Mr John Legard, Storrs Hall is a Grade II listed Georgian mansion and a classic example of the grand architecture and opulence of this period. Characterised by its proportion and balance, and created using mathematical ratios to determine its symmetry, the distinctive design serves as a testimony to his wealth and position in 18th century Northern England. Due to ill health, Legard sold the mansion in 1804 to another local wealthy businessman, Mr John Bolton, who then added the extension and created the park to lavishly entertain his friends; holding swanky regattas on the lake and hosting grand garden parties attended by writers, poets, officers, merchants, and grand socialites of the time. Now owned and run by the Hindle Family, this luxury hotel sits in 17 acres of manicured gardens and woodlands on the edge of England’s iconic Lake Windermere. 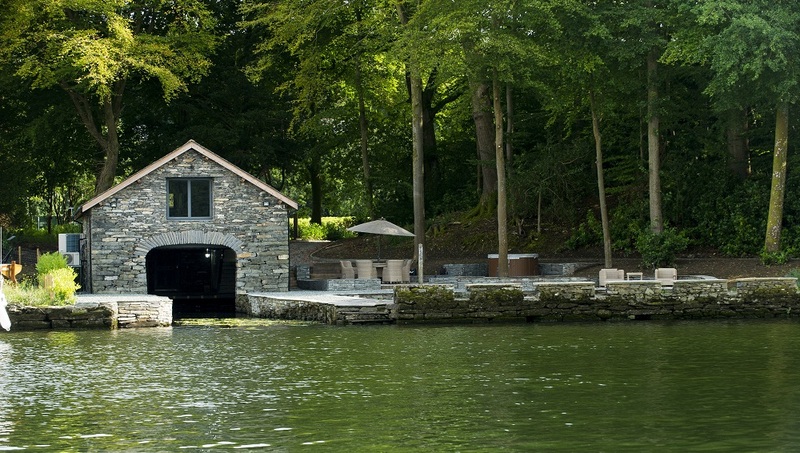 There is a boat house converted into accommodation which is a lovely option for a romantic lakeside break. Should you want to bring the canine members of your family, lakeside lodges are also available. Entering the hotel we were greeted by an impressive lobby area, where check-in was informal but efficient with friendly staff. As our room wasn’t quite ready on our early arrival, we made full use of the beautiful lounge and had lunch whilst taking in the views over the lake, (although we didn’t partake, the afternoon tea looked delicious). After lunch, the hotel staff showed us to our room; guided us up the staircase, around the circular landing and under a beautiful stained glass atrium. Along the way, walls were adorned with impressive portraits of previous owners and important nobilities of the original era. Our suite was favoured by the receptionist as the most beautiful room in the hotel, and she wasn’t wrong! 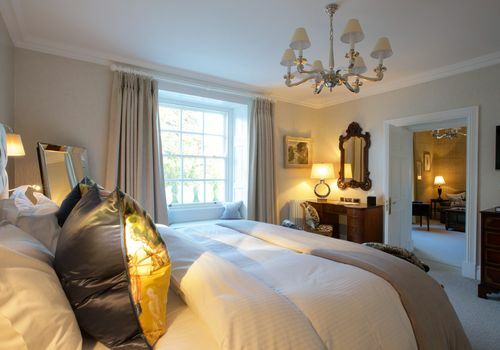 The main bedroom area had three large sash windows affording the great views of the lake and gardens. A large king-size bed sat against the back wall and period bedside furniture sat either side complete with lamps and reading lights. A velvet covered Chaise Longue and coffee table sat at the foot of the bed. Opulent curtains framed the windows, sitting against the delicate pine-branch emblazoned wall paper. This suite also had all the standard essentials such as suitcase stand, writing desk and chair, lamp, matching period table with coffee making machine facilities, more framed art on the walls and a matching framed mirror, and a just a nod to modern day gadgets with a flat screen TV. The bathroom was finished to exacting standards with a tiled floor and half tiled walls in a chic nutral décor. Fully equipped with twin hand basins sat under two wall mounted mirrors, and a double ended bath tub stood proud with an integrated television in the wall – essentials for that ultimate relaxation time. A fully tiled walk in shower with contemporary controls, heated towel rails. In contrast to the period style of the hotel, these modern bathroom facilities integrated into this luxurious building; a real feeling of ‘old meets new’ paired in perfect harmony. Prior to dinner we took a walk in the hotel gardens where the terraced patio and stoned seating area lead onto a very large grassed area running down to the lakeside. The winding paths around the garden lead through the trees into the extensive lake side grounds and onto the lake jetty and the stone constructed “Temple of Heroes” statue, renovated by the National Trust and which commemorates four of Britain’s most famous naval heroes. The slight chill and crisp air of the late autumn enhanced the extensive range of colours in the woodlands and the fresh dew settling on new spun silk webs across the evergreens sparkled like tiny diamonds in the sunlight. There was plenty of garden seating, along with the Victorian bandstand. The Lake Edge Restaurant with Head Chef Paul Nicholson at the helm, has two AA Rosettes and our visit to this award-winning restaurant was the highlight of our trip. The restaurant is located on the ground floor toward the rear of the main building with stunning lake views and a good vantage point to watch the sunset across the lake in the orangery. Tables are laid out to create an intimate dining atmosphere with crisp white table cloths and low lighting. After sampling the chef’s Amuse Bouche I followed with the creamy risotto featuring a 36-month aged Parmesan with wild mushrooms, a dish which was powerful, yet complementing in flavour and was enjoyed with soft warm bread, totally tantalising the taste buds. My wife chose the ravioli with a small fillet of salmon, prawns, Asian dressing and a delicate shellfish emulsion drizzle; a superb blend. For the main dish we both picked the beef with shallot, King Oyster mushrooms and tarragon, which was cooked to perfection and most delicious. Breakfast is served in the restaurant we had wonderful views of an early morning, mist-laden lake. A full continental buffet style breakfast was on offer, along with an a la carte menu. I chose the “Storrs Hall” English breakfast (also available as a vegetarian selection). My wife picked the grilled kippers with soft white bread and a poached egg. This was certainly a delightful menu to start of the day. Storrs Hall is in a perfect position for Bowness-on-Windermere and if you are visiting, I’d highly recommend you try a boat cruise on the lake (with Windermere Lake Cruises) which is also an optional part of Storrs Hall’s wedding package and would certainly make a romantic little trip for Newlyweds.